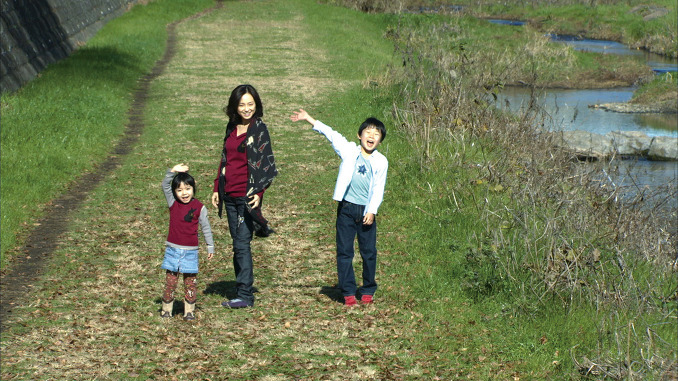 War photjournalist Yasuyuki Tsukahara (Tadanobu Asano) married popular manga artist Yuki Sonoda (Hiromi Nagasaku) and had children. 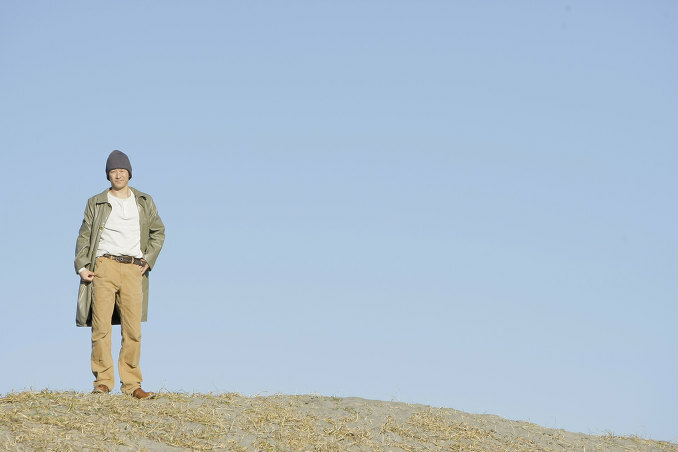 Because of Yasayuki's drinking problems the couple divorced. Based on the autobiographical novel "Yoi Ga Sametara, Uchi Ni Kaero" ("I'll Get Home When Sober") by war photojournalist Yutaka Kamoshida. "Wandering Home" is a fictionalized account of war photojournalist Yutaka Kamoshida and his ex-wife Rieko Saibara (award winning manga artist). 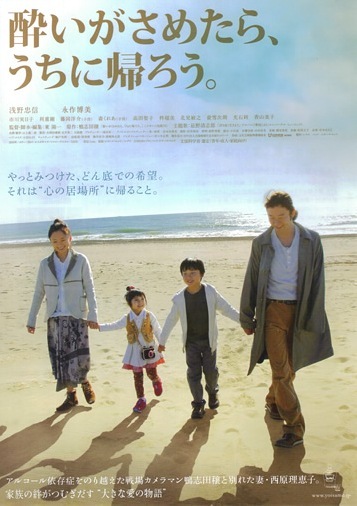 Kaasan Mom's Life | Mainichi Kasan (2011) * based on Rieko Saibara's autobiographical manga "Mainichi Kasan". Yoichi Higashi: "Hello, I am Higashi Yoichi (spoken in Korean). I can't speak Korean language, but one word I like is 'genchan uh yo' (it's ok). Thank you for so many people coming out to watch my movie. I am really happy." Moderator: "The movie is based on the autobiography of the main character in the movie. What made you pick the novel to turn into a movie? How did you first encounter the novel?" Yoichi Higashi: "I didn't know of the novel at first. I was asked to make a movie from the novel. The publishing company told me that it isn't a difficult novel to turn into a movie. After I read the novel, I thought the novel should be made into a movie, because Japanese dramas and movies are usually light. This is about when human beings face difficulties and how human beings can overcome and move ahead. It's a story of a human being ... that's why I thought I must make it into a movie." Audience Question: "In the movie, even though he is an alcoholic and, because of that, his family goes through many difficulties, the mood is generally bright. There's lots of humor in the film. I am curious if that came from the novel itself or you wanted to show the brighter aspects?" Yoichi Higashi: "The novel itself is bright and the wife from the novel (his wife in real life) is strong, so even through the difficult times she thinks of how to get over those things and live life ... The novel is that, but when I made the movie, I thought other things. After completing the movie, we had the premiere with alcoholic patients. While watching the movie they laughed a lot and afterwards how it reflected their own lives. The movies shows our life. In fact, when a person faces difficulties that person does not cry all the time ... in that situation the person is still a person. Smile, agony. Even though the male character and his family go through difficult situations, if the movie described them as always depressed then it would be a lie. I made the movie realistically." Audience Question: "I cried from the beginning to the end. The movie comforts people (her voice is breaking - pauses) ... in difficult situations. In movies, when people die they go to the sea. Is that the reason they go to the sea? What did that mean to his wife?" Yoichi Higashi: "She is a good viewer. When I make a movie, I do not have intentions to make the audience cry or laugh. I just want everyone interested in the film. I thank you for putting your emotions into the movie and sympathizing fully with the film. I haven't seen many films ending at the sea. The sea in the last scene of the film is the most beautiful sea ... I haven't seen such a sea in movies or stories. 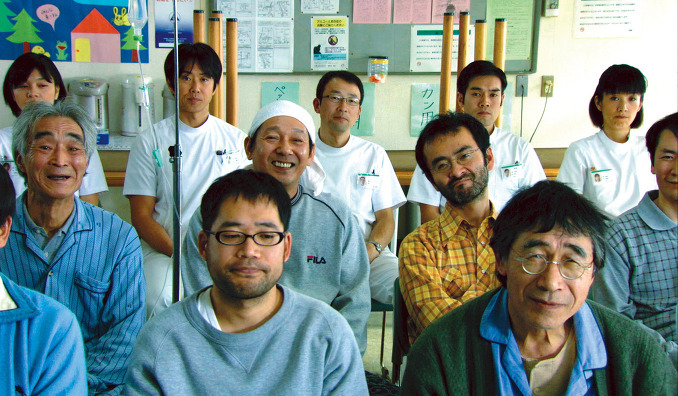 I first met the original writer (Yutaka Kamoshida) before I made the movie. But the next year he died. When I met the writer we decided that the ending scene would be at the sea. While shooting the movie he died. I thought again about the last scene. I could not give up the sea or having the final scene at the sea ... to show the writer's death. The wife's illusion was to let the audience know of the writer's death." Audience Question: "In film festivals there's a lot of 'indie' films that are calm, smaller in scope, with trivial things about the Japanese family. Japan seems to keep making these kind of movies which describes curing the family and neighbors. 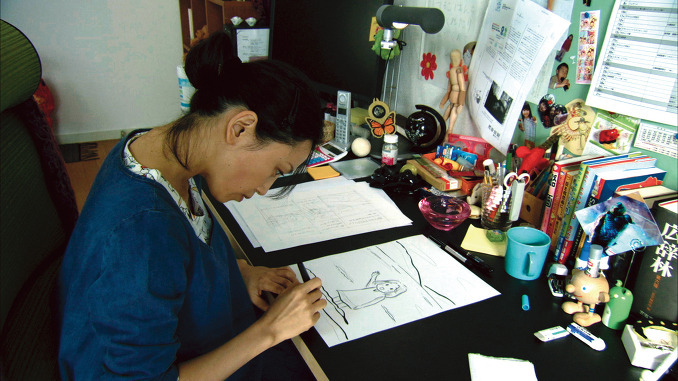 Why do these films keep coming out of Japan, but not many Japanese movies curing social ills? I am curious to have the director's opinion on this?" Yoichi Higashi: "I don't know about Japanese movies in general. I will only answer the question about my movies. I keep making movies about the trivial and family things, because if I do not understand the true human beings or the reality of human beings, I cannot talk about political or bigger social matters. Pay attention to person-to-person, how they live, if I describe them well and pile up these stories, then the audience can see a bigger society, bigger picture. If at first, you neglect the small things and focus on big things, than you miss the really important things." Audience Question: "I really enjoyed the film. I'm curious about the main character's obsession with curry? Do you like curry?" Yoichi Higashi: "I like curry. I do not know why the main character is obsessed with curry, but every one with an illness has that one thing they crave. Describe well a person with a disease ... they want one thing really." Audience Question: "People laughed a lot. Especially the scenes depicting the main character's thoughts. I had fun watching how his mind was described. I am curious of the differences in expressing the main character's thoughts in the movie and the novel. Did the novel use the main character's fantasies to describe his state of mind or was that something you made for the movie?" 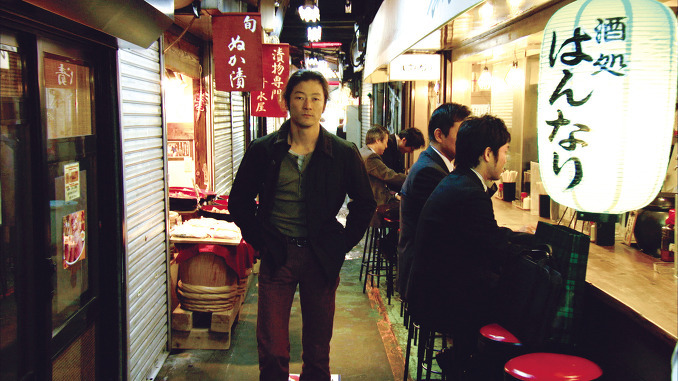 Yoichi Higashi: "When I read the novel those fantasies made me think it would be fun to make the movie. I wanted to focus on those fantasies by using new expressions, ways, that the line between reality and fantasy is not so clear." Audience Question: "I though this movie could be very dark, but thanks to the main character's wife, the entire movie can be bright and positive. The wife said 'too sad so am I happy'. I wonder how much you sympathize with that?" Yoichi Higashi: "That line was not in the original novel. I wrote that line because I thought that. I made that because I wanted to express that feeling I thought." Moderator: "Time for the Q&A has ended. Could you provide some last words for the audience?" 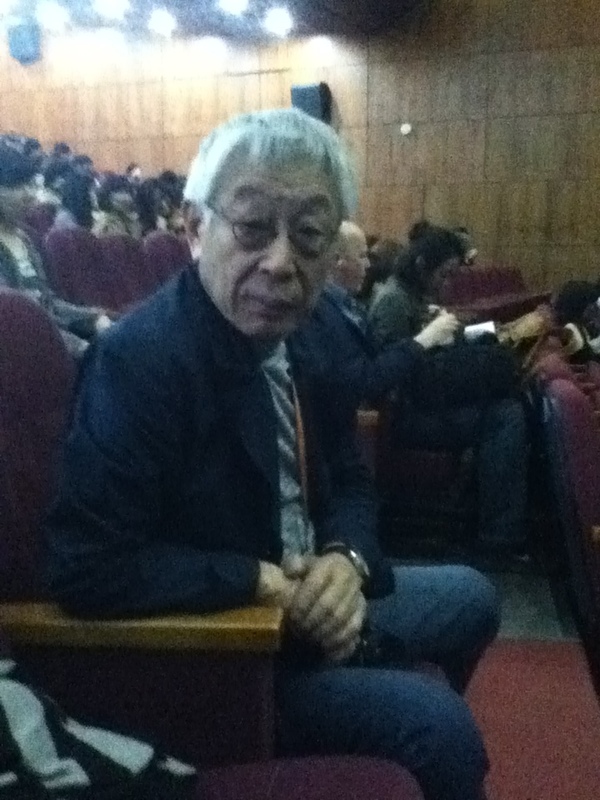 Yoichi Higashi: "I am surprised so many people came out to watch my movie in Jeonju. I knew Jeonju wasn't a big city like Seoul. I am touched and thank you. I don't want to interrupt the screening for the next film, so I will be outside in case someone has more questions."